Most American teenagers want a vacation in Italy, but the Betarrini sisters have spent every summer of their lives among the romantic hills with their archaelogist parents. Stuck among the rubble of the medieval castles in rural Tuscany, on yet another hot, dusty archaeological site, Gabi and Lia are bored out of their minds...until Gabi places her hand atop a handprint in an ancient tomb and finds herself in fourteenth-century Italy. And worse yet, in the middle of a fierce battle between knights of two opposing forces. Suddenly Gabi's summer in Italy is much, much more interesting. 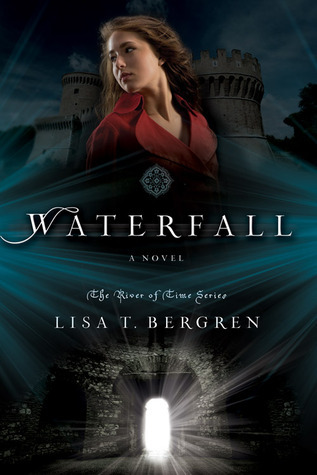 This is an excellent first book in the River of Time series, so much so that even before I finished reading - 2/4 of the way through - I knew that I needed to request my library for the last two. Gabby is intelligent, I can't possibly count how many times this was stressed, the girl is smart. She speaks Latin and knows how to sword fight. A little too convenient for the whole transported back to Medieval times aspect of the story? Yes, but at least it was made clear that she knew these skills prior to time travel. Gabi did not miraculously pick up said abilities in Marcello's time period, becoming boss-awesome at everything, nstead she always knew how and the skill happened to come in handy. I want to leave it at that. Because I appreciate a little convenience sometimes a little not a lot and I enjoy a writer giving me the benefit of, well, having a brain. Thanks for that, Bergren! I've actually read another book by her, Captain's Bride and didn't like that one much at all. The characters were all so back-biting there and seemed so selfish. So when I realized this and that book were by the same author, there was a little hesitance. Previous experience made me wary - I only got as far as 1/3 of the way with Captain's Bride - but my preconceptions were proved incorrect as this work is unique and, thankfully, much better! I'm not going to criticize overly this literature because honestly I enjoyed it, I really did. The characters are heavily realistic and the setting seems very true to Medieval century. Save a few inconsistencies. I liked the details added and that made the story more authentic, like the no indoor plumbing bit - gross but necessary! - the tub-bathing (literally) and the basic grossness of men back then. Needless to say, some were without manners? Nasty! Marcello and Luca (love that name!) were gems among men. Actually, I never thought either was perfect per se. I believed they were well-mannered, sensitive very attractive but not perfect. These are the kind of guys I would not mind having around! Another thing I would like to draw attention to is the romance; I felt it was very believable, there was the whole insta-attraction thing, but with Marcello who can really blame Gabs? She was attracted to him, that was certain It was satisfying that at the end Gabi was still kinda figuring out her feelings for him and it's the kind of love I see lasting. All in all I am very eager to see what happens in Cascade, how they explain the time travel to their mother and how Gabi/Lia get back! I couldn't put this book down for anything, the politics were interesting and enlightening. I recommend this to anyone in need of a good Historical Romance. This is it! Some things that annoyed me: Possible SPOILERS ahead!!!!! - I understood Lia's need to get back, I mean that period in time was as unpredictable as buck! What with people being beheaded at every what-instance and the Bubonic Plague, killing people off as well as Bloody Mary could, I sympathized being anywhere near a place like that would freak anyone out. BUT. I hated how whiny she was about getting back! Lia: "Ah, let's go home, Gabs, mom's probably worried blah blah blah blah and we need to get back before we blah blah with the space-time continuum." Judith: *Duck tapes Lia to dungeon* "Shut it, Lia! She's staying." Like really, all the girl cared about was getting home to a barely-there mother. What with her obsession with finding the tombs secrets, she would hardly feel their absence, this is what I was led to believe. *Sigh* She even wanted Gabriella going to the tombs after knowing about her conflicted emotions with Marcello! Ugh, it just made her come off as blessedly human and selfish. So many emotions for this book! Trust me when I say, you need to pick yourself a copy, STAT!